How do I only view weekly logs from the current term? Similarly, the Semester filter on the Reflections Dashboard allows you to filter reflections by semester. Having trouble with the progress bar counting hours from previous terms? Please click here for instructions on how to reset the progress bar. What to do when a student adds placement hours to the wrong dashboard? We don’t have an easy mechanism for hours to be transferred over from the Volunteer Dashboard. We encourage students to copy the information over to the Placement Dashboard. In order to prevent this issue from happening, students can set their default dashboard to the Placement Dashboard via their Account Settings. Instructions on how to do this can be found here. Teachers can also remove access to the Volunteer Dashboard so that it does not appear for students at all. To do so, a teacher must visit their Access page (Summary section) and click on the check mark under the Volunteer column. That turns the check mark into an ‘x’. Once complete, students will no longer be able to view the Volunteer Dashboard. This will prevent students from accidentally adding their Placement hours to the wrong dashboard. When creating an account, students have the choice to sign up either through Hour Republic or Desire2Learn. TIP: For more details on how to create a student account, click here. If student OENs are provided to Hour Republic before student sign ups, and the OEN matches our records, then the student gains automatic access to Hour Republic. If a student is accessing Hour Republic via D2L, then the OEN automatically gets transferred over. Students that register for the first time via D2L automatically gain access to Hour Republic, and never have to register again. When logged in, students can click on the arrow beside their name (top-right), and select Settings from the drop-down menu. (i) Select “Placement Dashboard” as the default dashboard from the Default Page drop-down field (near the bottom of the Settings page). For more details on how students can add weekly logs, click here. Linking students to a teacher creates an active list of students. For more details on how teachers can link themselves to students, click here. How do I view current and previous student weekly logs? Now only logs/hours from that term will appear on the student’s profile. NOTE: We never delete logs/hours just in case they need to be accessed again. Why can’t my student view my Reflection Topic? Check the End Dates for your Reflection Topics to see if the date has passed. If so, then this is the problem and it can be solved by changing the End Date of the topic to a later date. To check if a student is linked to a different school, go to that student’s weekly logs and see if their logs appear. If you cannot view them then this is the issue. You can also check which school your student is linked to by viewing your student’s Settings (click here to see how to do so). This issue can be solved by having the student update their school in their Settings. If neither of these reasons appear to be the cause of the problem, email us at info [@] charityrepublic.com and we’ll look into it for you. How do I access a student’s settings? Student settings contain information such as student name, OEN, school, and email. Teachers can view a student’s settings via the Access page, Placement Dashboard, and Volunteer Dashboard. All three methods show the same information; they represent different ways to access student settings. 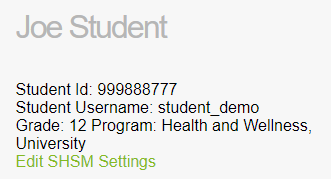 How do I locate a student’s username? There are 3 different ways for teachers to locate a student’s username in Hour Republic. (B) The second method is by viewing a student’s individual dashboard. The Placement, Volunteer, and SHSM dashboards can be used to locate usernames if the student has access to them. A dropdown menu will appear which allows you to generate a report in PDF or Excel format by clicking on the report in the appropriate column. How do I access past placement information? Teachers can access the placement information of past placement students by providing them with access to the Placement Dashboard, if access was removed (if you need a reminder on how to do so, click here) and then linking themselves to the student in question. These students will then appear on the teacher’s Placement Dashboard and their past placement information can be viewed, with access to relevant reports, etc. Q: How do I provide my students with access to the Placement Dashboard? A: If a student does not have access to the Placement Dashboard automatically, then teachers can provide access manually. 1) Visit your Access page and search for the student(s) you are providing access for via the search bar or alphabetically (if you are having trouble locating a particular student(s), make sure Status, Grade, and Semester are set to “All” in the filters). This can be completed via the Summary or Co-op sections of the Access page. 2) Under the Placement (Co-op) column, the student will either have an x or a check mark. The check mark indicates that a student has access to the Placement Dashboard while the x means they currently do not have access. 3) Click the x to provide a student access and it will turn into a check mark. Q: How do I remove access to the Placement Dashboard? A: Follow steps 1 and 2 above. Then, click the check mark and it will change it into an x, indicating that the student no longer has access to the Placement Dashboard.